Home » Everest » Everest 2017 Coverage » K2 and Everest Winter Climbs are on! K2 and Everest Winter Climbs are on! After months of speculation, Alex Txikon will return to attempt a winter, no supplemental oxygen summit of Everest. And the Polish K2 team will leave Poland on 29th December for their winter K2 attempt. UPDATE: The K2 team has left Poland. To claim a true winter ascent of a northern hemisphere peak, the summit must be reached during the calendar winter of the northern hemisphere. For 2017/18 this begins with the winter solstice on December 21, 2017 at 11:28 am EST and ends with the spring equinox on March 20, 2018 at 12:15 pm EDT. Also to be fully certified as a winter ascent, not only the summit has to be reached within the winter calendar, but the start of the expedition cannot be before winter solstice either. Practically this means that the Base Camp must be reached after the winter solstice. I spoke with the team’s project Manager today and confirmed the K2 team will leave Poland on 29th December for Pakistan. 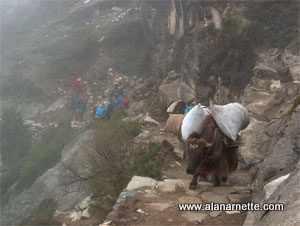 It will take a few days to get back on the road to Askole where they will begin the 7 day trek to K2 Base Camp. They should arrive at Base Camp around 15th January, maybe a bit earlier. I also confirmed they will be climbing without supplement oxygen and plan on taking the Česen route. As you can see from this photo, the Česen and Abruzzi routes merge at Camp 3. The entire expedition is being lead by 67 year-old Krzysztof Wielicki who lead the last Polish K2 attempt in 2003. Wielicki has summited all of the 8000ers without supplemental oxygen. The Polish Ministry of Sport and Tourism has funded the expedition to the tune of $275,000. Jasmine Tours in Pakistan is the ground agent for the team and will provide 6 high altitude climbers from Pakistan for the expedition support. The team is composed of Adam Bielecki, Marek Chmielarski, Rafał Fronia, Janusz Gołąb, Marcin Kaczkan, Artur Małek, Piotr Tomala, Jarosław Botor and Dariusz Załuski, Denis Urubko and Wielicki. In my view, its all about the weather. They certainly have the skills and raw power to summit -that’s no question. But to get a few days with winds under 40 mph – that’s the key, so we will see! 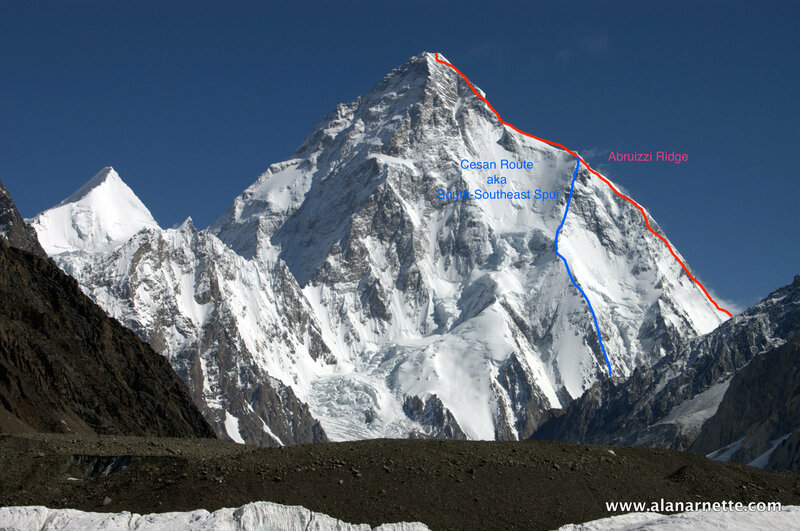 For more details on K2, winter attempts and this year’s effort, see this post. There have been few winter attempts due to the difficult and financing involved. Alex Txikon attempted Everest last year but was stopped by deep snow and harsh weather on his second attempt. As you can see from his GPS tracker, he reached 7,950 meters before turning back last year. Now he is returning for another attempt. He made the announcement on Twitter pus on various other media outlets. This is video of his announcement in Spanish. Alex may be one of the few climbers on the planet qualified to attempt climbing Everest in the winter without supplemental oxygen. In 2016/17 he and teammates, Simone Moro and Pakistani Muhammad Ali Sadpara knocked off Nanga Parbat . The 36 year-old Basque climbers will be joined by his Nanga partner, Muhammad Ali Sadpara on this year’s Everest attempt. They are scheduled to arrive at Everest Base Camp the first few days of January 2018. Last year, Txikon carried a significant part of the load to establish high camps and to put the route in the Khumbu Icefall. He was supported then by Seven Summits Treks. This year he is saying he will back off the many days of work and do a better job of pacing himself. Txikon posted this ghostly image of himself last year saying he lost 12kg/26 pounds on his already lean frame. The team arrived in Kathmandu on Christmas day, 25th December 2016 with plenty of time to summit before 20th March, 2017 – the end of winter. They spent weeks setting the route thru the Khumbu Icefall and establishing Camp 1 and Camp 2 before leaving Base Camp aiming for a 14 February summit. Their first summit attempt didn’t go well. Txikon, and Seven Summits Sherpas: Norbu, Chhepal left base camp on 10 February for the summit push arriving at Camp 2 in about 8 hours. The next day 3 more Sherpas, Nuri, Furba and Pemba joined them. They reported extremely cold still air temps in the -20F to -30F range, without windchill. They left Camp 2 to establish High Camp at the South Col and began to experience even worse weather -45C/-49F air temp with 60 kph/37 mph winds. This puts the wind chill at -70C/-95F, perhaps a bit lower at this extreme altitude but still deadly cold. Skin would instantly freeze in those conditions and even with the world’s best down suits the climber would soon become chilled beyond recovery. Given they were climbing without supplemental oxygen, the risks were dramatically increased. On the push from Camp 2 directly to the South Col, there were fighting the wind on each step. At the South Col, the high winds made it impossible to set up a tent. They arrived without sleeping bags assuming a short stay in the tent before pushing for the summit. The climbers were becoming dangerously cold. As they struggled to establish camp, the wind broke a pole sending Txikon searching in tents from last spring’s expeditions for a spare. He finds not one, but two dead bodies in separate tents. He didn’t identify them. After only half an hour, with harsh winds making establishing Camp 4 impossible, they all retreated to Camp 3 for a short, cold night then down to Base Camp. But while on the Lhotse Face, an avalanche of snow and mostly falling rock, hits the team sending Txikon sliding hundreds of feet and injuring Sherpa Chhepal. Txikon went to Kathmandu to recoup and arrange for a new set of climbing Sherpas. They returned to base camp where he was met by Reinhold Messner to wish him good luck as he left for Camp 2 on 6 March 2017. They reached Camp 2 but were met by high winds. A tiny window of low winds was forecasted for 8 March but would quickly regain strength for the foreseeable future. Txikon noted winds well over 40 mph at Camp 2 with air temp of -40F. He knew the winds would be higher and the windchill would have been deadly so he called an end to their expedition. These are two clips from his previous efforts including a documentary that made on the climb. Let’s look at the history for a moment. A paltry 0.2% of all summits since 1953 have occurred in the winter. The Himalayan Database reports that the last successful winter summit was in 1993 and the only previous summit without supplemental oxygen was by Ang Rita Sherpa in 1987. Technically winter begins on the winter solstice on December 21st or 22nd and ends on March 20th. To add to some controversy, the solstice in 1987 was on December 22nd at 4:45:13 and Ang Rita summited at 15:20. There have been 21 winter expeditions with only five successful summits. Best of luck to all. I’ll be covering these climbs throughout this winter. Wielicki has summited all of the 8000ers without supplemental oxygen. Good mornning Alain ! Are you sure about that ? Because as of my knowledge of this, Wielicki Climbed the Everest during winter time with supplemental oxygen . Thank you Kalifa. I double checked the Himalayan database and you are correct. He did use oxygen on his 1980 Everest summit. I wish all the best to all the teams involved and pray for their safe returns. 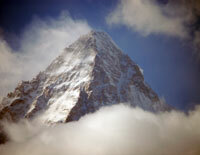 I do hope, however, that the mighty K2 remains unconquered in Winter! Do you know anyone with Alzheimer's?